Photograph provided by Gary Brown. All Rights Reserved. Wing Commander(*) Kenneth Horatio Wallis MBE, DEng (hc), CEng, FRAeS, FSETP, FInsTA (hc),PhD (hc), RAF (Ret'd), has been one of the leading supporters and developers of autogiro’s and gyroplane research and development following World War II. He designs and develops autogyros for, research & development, surveillance and military use; his designs are not available for the general public. Born on 16 April 1916 at Ely, Cambridgeshire, Ken Wallis would find a passion for mechanical applications that were to span a lifetime. At the tender age of 11, Wallis started building a motorcycle. Considering his fathers interest in aviation, Ken’s father and uncle built an airplane in 1908 to fly the English Channel an event won by Louis Bleroit, that by his twenties, Wallis’s interest turned toward the sky when he purchased and assembled the materials to build a small airplane called the “Flying Flea”. The airplane was a fairly popular homebuilt aircraft of the 1930’s. The turning tide in Europe, with the military expansion of the German border by Adolf Hitler threatening England, was cause for Wallis to enter his military career. Entering in 1938, Wallis found himself in the Royal Air Force flying patrols in the Westland “Lysander” by 1940. The “Lysander” was a general- purpose observation and liaison aircraft, which had good short field performance characteristics. This ability to land on short unprepared terrain lead to the “Lysander” being used for the insertion and recovery of agents on missions behind enemy lines to conduct clandestine missions mainly in France. The “Lysander made its first flight on June 15 1936 and entered service in June of 1938. The airplane was retired from active use in the United Kingdom in 1946. This great historical video provided by Ed "Bomber Guy". In 1942, Wallis was transferred to RAF Bomber Command, flying the Vickers “Wellington” near Grimsby. Grimsby was a seaport with great strategic value to the German military. Located on the eastern coast of England, Grimsby was not only close to mainland Europe but had a very well established infrastructure that would be needed for occupation by an invading Nazi Army. Grimsby was spared from much of the Luftwaffe’s bombing campaign but it was the first city to have the new “Butterfly Bomb” employed, which caused much devastation. Later evidence revealed that had the German invasion of Great Britain been successful, Grimsby would have been one of the first landing points due to the combination of its location and economy. The Vickers “Wellington” was designed in the mid-thirties as a British twin-engine, medium bomber. Designed by Vickers-Armstrongs' Chief Designer, R.K. Pierson. The Wellington was highly utilized during the first two years of World War II; it would later be replaced as a bomber by much larger four-engine designs like the Avro Lancaster. The Wellington was popularly known as 'the Wimpy' by service personnel, after J. Wellington Wimpy from the Popeye cartoons. Wellington video provided by: Ed “Bomber Guy”. Coastal Command Wellingtons carried out anti-submarine duties and sank their first enemy vessel on 6 July 1942; and versions fitted with a 48 ft (14.63 m) diameter metal hoop were used for exploding enemy mines by generating a powerful magnetic field as it passed over them. RAF Bomber Command “Wellingtons” flew 47,409 operations, dropped 41,823 tons of bombs and lost 1,332 aircraft in action. The total number of Wellingtons built was 11,461, in 16 variations, the last of which rolled out on 13 October 1945. Wellington with Magnetic Hoop video provided by: Ed “Bomber Guy”. It was during his time with the RAF in World War II, that Wallis would assume the duty and responsabilities as Wing Commander, a title that Ken Wallis would carry with pride for the rest of his life. Another interesting aspect of this period was when Ken developed the idea to create the electric slot car. A project which he began working on in the barracks, during down times. Wallis developed everything from the tiny motors, to the idea of using a pin to hold the car to a track (which he also had to invent) thus giving birth to the hobby of slot car racing. Ken Wallis would finish his World War II duty in Italy. Entering the “Cold War”, Wallis was assigned duties in research and development. In 1956 Ken was selected as part of a joint exchange team to work and fly on the massive Convair B-36 “Peacemaker”. The “Peacemaker” was a United States Air Force strategic bomber built by with the sole purpose of delivering nuclear weapons. The B-36 was the largest mass-produced piston engine aircraft ever produced and the largest combat aircraft ever built. The B-36 was designed by Ted Hall and made its first flight in August of 1946. It entered service in 1949 and was retired from active service in February of 1959. The “Peacemaker” had a range of over 6,000 miles and a maximum payload of at least 72,000 lbs. ; the B-36 was the first operational bomber with intercontinental range. Always looking for new challenges, Wallis gained interest in power boating which he kept up until 1957, when he won the 56-mile long Missouri Marathon. In 1958 he was the "Weapons Officer" Headquarters Fighter Command. As O.C. Armament on the first "Canberra" jet bomber station, he was responsible for improvements to the "Canberra" armament. It was for this and other inventions in armament have been recognized by the" Royal Commission on awards to Inventors". Canberra video provided by Ed “Bomber Guy”. The English Electric B-57 “Canberra” was a first-generation turbine-powered bomber manufactured in large numbers through the 1950s. Manufactured by English Electric, the design had its start as early as 1944 as a replacement to the DeHavilland “Mosquito”. In 1945, a contract was signed, but post-war military reductions delayed the production and first flight until May of 1949. The “Canberra” entered flying service in 1951.The design proved to be very useful as a multi-role aircraft, flying such missions as tactical bomber, reconnaissance and weather research vehicle. The “Canberra” remained in service with the RAF for 57 years, retiring from active service in June of 2006. A different kind of Fairey. 1961-64 commanded the Tactical Weapons Group at the Aeroplane and Armament Experimental Establishment, Boscombe Down. In 1958 the Fairey Company began development of the “Fairey RotoDyne”. A hybrid rotorcraft that was designed to take off and land vertically, like a helicopter, and transition to a gyroplane type flight mode when in cruise flight, meaning the rotor was non-powered. The intent of the design was to provide commercial transportation of passengers and cargo at a speed near 500 knots. In addition to commercial applications the militaries of many nations outside of the U.K. were also interested in the design. Ken Wallis worked with the Fairey design team and flew in several International Airshows in formation with the “RotoDyne”. Fairey Rotodyne video use granted by John. Designer, Builder and patent applicant for the modern offset rotor-gimbal. This fantastic contribution by Ken Wallis begins from early gyroplane design in a design by Raul Hafner. Hafner, an Austrian emigrant to the United Kingdom, would become chief designer for the Bristol line of helicopters but in 1940 Hafner put his work for the Ministry of Aircraft Production. Hafner began work on the single seat “Rotachute” (a gyroglider) from which both Igor Bensen and Ken Wallis would evaluate to design their own forms of gyroplanes. Wallis was intrigued with the Bensen B-7 “Gyro-Glider” and while assigned to SAC he returned to England with a pair of McCulloch engines. Ken quickly made some design changes of his own to the B-7 design, such as scrapping the overhead control stick for a more conventional control stick. He also found that the self - aligning B-7 rotor allowed for a positive and negative ten degrees of movement. Wallis rightly reasoned that the design would allow ten degrees to be exceeded in certain positions of the rotor controls. Wallis modified his rotor and advised Bensen Corporation of his changes. Later B-7 drawings were modified taking into account Wallis’ findings. Commander Wallis’ first powered autogiro flight took place on May 23, 1959 at Shoreham Airport. While enjoying his new - found passion, Wallis soon had a short list of areas to improve the design. One such item being a prerotator to get the rotors up to speed and the other being a better rotor gimbal (the original design of Bensen being a similar design of that to Hafner’s “Rotochute” design) to improve the pitch stability of the initial gimbal design. Please keep in mind that Wallis’ engine powered B-7 was ahead of Bensen’s B-7M being released to the public. Wallis’ prototype gimbal was used on the new WA-116 autogiro and was patented in the UK with the rights belonging to the British Crown owing to Wallis being a RAF officer at the time. But in 1960, the Wallis WA-116 provided suitable proof of the new gimbal design. Bensen offered his later kits also powered with the same McCulloch engine that Wallis was already flying with. Bensen also offered, as advertised in 1964, that hands off flight was now possible due to the “Bensen off-set gimbal rotorhead”. Since the Patents were owned by the British Crown there really was no recourse of action for Wallis but his offset rotor gimbal design has become the practical standard of gyroplane rotorhead design ever since. Wallis’ own assessment of his design states that there are still a few tricks of design, which can make a difference. In any case, Wallis’ off-set rotor gimbal has provided the gyroplane industry with a safe and effective system used around the world even to this day. Wallis retired from his military career in the RAF in 1964, to devote his time and energy fully into ultralight autogyro design and research. Ken began experimenting with gyroplanes as early as 1959 and 1960. These early aircraft and experiments were to prove his theory and design scale parameters for development of an aircraft with potential civil and military application. 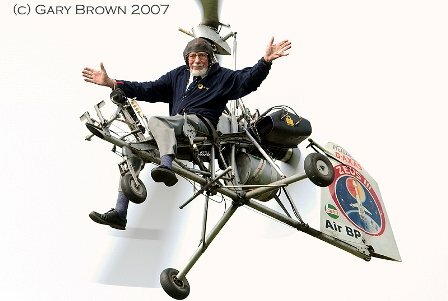 Wallis attained his goals and validated the concept of light autogyro flight in 1961 in an aircraft of his own design. From 1962 through 1963 Ken Wallis and his little gyroplanes, in various versions, were put to task with the British Army Air Corps. The winter season of 1962 through 1963 was a particularly cold one and pilots testing the gyroplane were not very impressed with the open design of Ken’s autogyros, thus ending the Army’s evaluation of the design and ending the project. Not to be thwarted by the lack of interest from the military, Wallis concentrated his research in practical civil applications of the gyroplane and also as a personal hobby. Subsequent research contracts were awarded from such companies as Plessey Radar, The British Aircraft Corporation, Sperry Radar, and the Ministry of Defense just to name a few. Among many of these contractual agreements came some movie work that would make Ken Wallis and his autogyros very famous. Among one of the first of these movie agreements was the use of a little gyroplane for the James Bond feature film “You Only Live Twice”, in a 1966. The little autogyro was named Little Nellie, a sleek yellow striped gyroplane outfitted with rockets and smoke. Ken provided not only the aircraft but was the stunt double for Sean Connery as James Bond. The movie was shot on location in Japan and Spain. The same year another film shot in Brazil and Italy featured one of Wallis’ 1961 prototype autogyros in a “Spaghetti Bond Film” completed by the film studio Roma. It was also a Wallis autogyro that was used in the film classic original “The Martian Chronicles”. Ken has also provided his services for filming of documentaries that required aerial footage. Ken Wallis has participated successfully, flying his autogyros in such exercises as Aerial Quick Deployment Exercise "Green Lanyard", in 1982, "Gryphons Gold" in Germany. After 25 take-offs and landings on a moving lorry, flights were made to and from small vessels at sea, which were too small to accommodate a helicopter. The little autogyro performed particularly well in the day and night, all weather Post-Attack Airfield Damage Reconnaissance Exercise "Keswick" at R.A.F North Leffenham in 1987. Infrared Linescan was carried, the imagery being transmitted to the ground in real time. Public and Commercial use of the Autogyro. Picture provided by Gary Brown. All Rights Reserved. Ken has undertaken numerous projects to validate the diversity, economic advantage and versatility of the public or commercial application of the autogyro. As previously described, the gyroplane makes for a very suitable photographic platform but Ken Wallis was able to validate even more exotic uses for this role. Wallis autogyros were used for work with the Saudi Arabian Ports Authority and buried cadaver search methods in conjunction with the Police Development Branch to include airborne search methods for police work. Mr. Wallis certainly has embraced his “retirement” to not only help support the growth and development of the autogyros role in aviation but has also been a prolific designer, builder and test pilot for a large variety of gyroplane aircraft all of his own designs and modifications. After building nine single seat variants of autogyros, Wallis began development and construction of a two-place gyroplane in 1969. The new design was christened the WA-116T, which was used to secure the closed circuit world record in 1974 for the 670.26 km category. 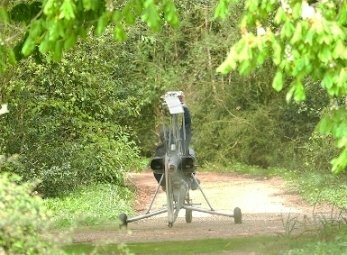 The Wallis autogyros have been powered with a variety of powerplants ranging from 72 to 160 hp. It can be quickly surmised that the performance for each of these machines was matched for the particular tests and functional roles for which the aircraft was designed. Ken Wallis has designed 19 different models of autogyros over the course of his research on gyroplanes. In 1973, Wallis and his cousin decided the time was right to try and build a copy of the airplane their fathers had built at the turn of the century. The original aircraft had been destroyed in its storage following a windstorm. In 1978 the “Wallbro” was successfully flown. In the early 1980's Ken entered into a verbal agreement with a company to develop the Wallis line of autogyro's as fully certificated aircraft. Unfortunately, this company also decided to make some design changes to Wallis' design which had serious impacts on performance and safety. Ken was forced to terminate his agreement with this group in order to ensure that his designs were not corrupted into a version which was not produced as originally designed. It is for this very same concern that Ken Wallis has not provided his designs as plans or kits for fear of what others might unknowingly modify their aircraft into, an aircraft with something far less safe than that for which it was engineered. Ken has validated the commercial usefulness of the gyroplane in movie production, as an airborne photgraphic platform and in successful tests in law enforcement work specifically in cadaver searches. Commander Wallis still believes in the commercial success possible for the very economic gyroplane beyond the sport aviation marketplace. So if Wallis has had a so called failure in autogyros it has been in this area but, rightly so, he has decided that personal pilot safety and that of the general public was more important than to allow a manufacturer to produce a substandard product carrying the Wallis name. Well done Ken Wallis! It took Ken nearly the rest of the decade and much legal battle to clear the verbal contractual agreement of production of Wallis Autogyro's but Ken did win his right to see that his aircraft, if developed into production, are built as they were designed. Thanks to Tim Chick for the use of this video. All previous autogyro world records were held within the United States prior to 1968. These include world records for altitude, speed, and range that is until Ken Wallis set out to challenge these records. All these records have been broken by Wallis autogyros and flown by their designer/constructor. In addition, a further eight world records were established by Wallis, including the first ever non-stop flight in a 1000km closed circuit. Wing Commander Wallis has acquired 34 world records over the years relating to autogyros. Kenneth Wallis is also recognized as the oldest pilot to set a world record (with the FAI) by setting the fastest climb to 3,000 meters in an autogyro on 19 March 1998 at the age of 81 years and 336 days. 1963 The "Alan Marsh Medal" awarded by The Royal Aeronautical Society and The Helicopter Association of Great Britain. 1969 The "Segrave" Trophy awarded by The Royal Automobile Club and the Royal Aeronautical Society. 1973 The "Breguet" Trophy awarded by The Aero Club de France and the Royal Aero Club. 1975 The Silver Medal awarded by The Royal Aero Club. 1975 The "Rose" Trophy awarded by The Helicopter Club of Great Britain. 1980 Honorary Fellowship awarded by Manchester University. 1982 The "Reginald Mitchell" Medal awarded by Stoke-on-Trent Association of Engineers. 1984 The "Rose" Trophy awarded by The Helicopter Club of Great Britain. 1985 The "SegraveTrophy" awarded by The Royal Automobile Club and the Royal Aeronautical Society. 1989 The "Salomon Trophy" awarded by The Royal Aero Club. 1995 The "Rotocraft Gold Medal" awarded by Federation Aeronautique Internationale. 1996 Member, Order of the British Empire awarded by Her Majesty The Queen. 1997 Honarary Doctorate of Engineering awarded by The University of Birmingham. 1998 The "Sir Barnes Wallis" Medal awarded by The Guild of Air Pilots and Navigators. 1998 Honorary Fellowship awarded by The Society of Experimental Test Pilots. 1999 Special Award awarded by The Air League. 2003 Honorary Doctorate of Philosophy awarded by Hofstra University, New York. Ken Wallis knew from a very early start in his gyroplane development that in order for the gyroplane to gain acceptance people would need to not only see the practical application of the autogyro but also to view its remarkable maneuverability, stability, and inherent safety of the type. To show the public these flight characteristics Ken would quite frequently perform demonstrations at airshows across the globe. Following the almost surreal success of the autogyro in the Bond film, Wallis would perform a demonstration many times to the music and drama of the films plot. Ken would be and continues to be a focal source as the unofficial European Ambassador for the autogyro. Wallis’ contribution to the growth of the sport gyroplane is no less an achievement as that which was being done by Igor Bensen and Ken Brock in the United States. Mr. Wallis never shied away from the media be it newsprint or visual media to talk about his passion with his autogyros. Regardless if the topic was on design, safety, history or the functional roles for which autogyros can be used, Ken always made time to spread the word. My great thanks to Art Spink, Sydney Australia for the use of this video. As Ken Wallis is gaining in years he has slowed his pace a bit which can be understandable for a person not only of his age but also through all the accomplishments. He still attends an Annual airshow named in his honor called Wallis Days. He is also the active President for the Norfolk & Suffolk Museum. 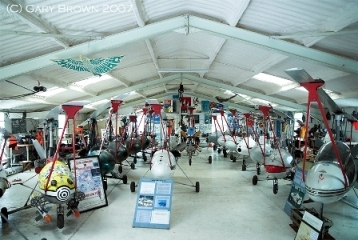 Mr. Wallis also does speaking engagements for many aviation functions either on his time in the RAF or about autogyros. Ken also still regularly flies his autogyros and is still planning flights to break present autogyro records. It is almost sad that in all that Ken Wallis has done to prove the economical advantage of the gyroplane, in certain flying mission roles, that the widespread acceptance of the gyroplane is still hanging in balance. Ken Wallis in all so many ways advanced a part of an industry from its reborn infancy to a far more mature state from his direct contributions. Ken has provided proof of the useful and economic employment of the gyroplane in the modern world. With continued technological advances, with smaller and lighter subsytems, it appears the gyroplane can be a far more economical option for certain research and photographic missions. In personal retrospect, I would have to agree with Mr. Hancock’s suggestion of knighthood for Wing Commander Ken Wallis. There being no such honors within the United States it is hard to understand what would be required of one to provide more to their country, to their sport and industry, and how one could ask for a better role model. In all his accomplishments no one can argue the immense passion for the autogyro as that in Ken Wallis. "Needless to say, Ken has featured in very many programmes, documentaries, films and printed articles. In short, he is a dear friend and I see him as a living legend. Many people in this country regard him as a local hero and a national treasure but representations by me and others have not yet managed to promote better recognition by the State. Perhaps one day......"
Quote from author Ian Hancock in an e-mail to Ken Fietz dated 2-15-2008. * In the United Kingdom, it is customary that officers above a certain rank retain their title upon completion of their service. It is appropriate that the rank of Wing Commander be applied when addressing Ken Wallis. For the purpose of avoiding a dry read, the use of Mr. has been used and not out of any disrespect or lack recognition. Any use of Mr. should be regarded as a direct replacement for the title Wing Commander for the purpose of this writing. 1) Page Note: In reserching data for this tribute, I managed to make contact with author Ian Hancock. Myself being from America, I had to ask Mr. Hancock about British "Knighthood". What follows is a quote (with his permission) directly from our correspondance. "I have criticised the lack of a proper reward for Ken in the book, and elsewhere. He did receive the MBE in 1996 but it is the lowest on the scale: school cleaners and similar public servants get such a reward for 20 years service. A professional footballer or pop singer often gets a higher award these days. Ken has been recognised for his contribution to aviation and as a skilled engineer by many learned bodies and institutions, both here and abroad. The UK has a history of failing to recognise great men until it is too late. I believe Ken has been badly overlooked for many reasons including: 1) his list of 17 World Records (34 actually because each is in respect of two classes of autogyro) is, I believe, a record in itself; he is also in the Guiness Book of Records as the oldest aviator to have set one. 2) His wartime service was never properly recognised - most RAF bomber pilots on surviving a tour of bombing operations received at least the DFC - he received nothing. 3) His skills in bringing back badly damaged Wellington bomber aircraft following raids over Europe, without loss of crew members, alone warranted at least one gallantry award. 4) His postwar research of captured armaments, his invention of the bombing-up procedure for the then new Canberra jet bomber in RAF service, his investigations and resulting inventions to improve weapons such as the Enfield No.4 Rifle and the 25lb Practice Bomb are but small examples of his many, important contributions in different fields. 5) the modern-day autogyro owes very much to Ken's work since the late 1950s. He has also embarked on a huge range of activities with his fleet of autogyros (currently 19) and each one tends to be designed to carry equipment for a specific purpose. Whilst Ken protects his design and would prefer to see it in production for "serious" work, other designs have sprung up since and now populate the world - particular for leisure flying. " In my personal observation it would appear that the "Knightly" attributes of courage, honor, duty, heroism, integrity and strong morals in service to ones Crown are no longer the qualities sought for Knighthood. A shame, really, that Wing Commander Wallis' contributions that have literally benefitted generations has been to date recognized as meerly a footnote by his own government. Graphic provided by Gary Brown. All Rights Reserved. Ken Wallis life history, achievements, Honors: Direct correspondance with author Ian Hancock via e-mails over the course of writing this tribute. Ken has been the President of the museum (Norfolk & Suffolk Aviation Museum, Flixton, Suffolk, UK) for over 30 years; Ian Hancock is the Chairman. Formed in 1972 and all are volunteers. They have 60 aircraft and 23,000 artifacts on display, the site link can be found at www.aviationmuseum.net which has a "Shop" page and includes details of the book. All proceeds go to the museum. Lysander Historical Video: Ed thanks so much for your contributions to this page. Wellington Videos: A special thank you to Ed “Bomber Guy” for the use of this video. Special Thanks: Gary Brown for the use of his still photographs of Ken Wallis. Canberra “News” Video: Thanks again to Ed “Bomber Guy” for the use of this video.